Win a Yeti Cooler, Great Sunglasses from Costa and Smith, and More in our April Sweepstakes! Win some of this sweet swag! 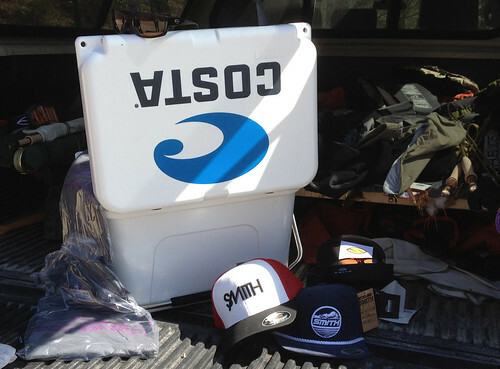 A Yeti Roadie 20 Cooler with a killer Costa logo on the top. The prizes will be given away individually, so you have eight chances to win. Enter the contest by using the cool widget below, which offers you a couple ways to earn entries and increase your chances of winning. The winners will be announced next Wednesday, April 17. You can enter twice, by liking the Orvis Facebook page or joining the mailing list. Whether or not you’ve already done one or both of those, you just have to click “Enter” in the widget below and follow the directions. In the meantime, check out our new models of Costa and Smith Optics sunglasses. I love to win Yeti cooler! I would love to win a yeti cooler! !